Due to the holidays, shipping madness, the increased risk of losses, and the lack of open libraries willing to send things, the Interlibrary Loan Department limits ordering and shipping during the second half of December. If you need anything before winter break request it now! Interlibrary loan requests submitted to ILLiad after Dec. 15th will be ordered in early January. ILLiad article requests will continue to be filled by RapidILL through Dec. 22st, but requests must have a valid ISSN and year to be processed by Rapid. Use Worldcat to find your citations and submit your loan requests! This entry was posted in Midd Blogosphere and tagged Closed, ILL, ILLiad, interlibrary loan, library, Library News, lisblog, Middlebury Community Interest, MiddPoints, Winter Break on November 28, 2018 by Rachel Manning. This entry was posted in Midd Blogosphere and tagged Closed, ILL, ILLiad, interlibrary loan, library, Library News, lisblog, Middlebury Community Interest, MiddPoints, Winter Break on December 8, 2017 by Rachel Manning. Joe is still working with Panopto on testing updated integrations before activating. Faculty are seeing errors when they preview a quiz in Panopto. The portfolio meeting last week provided a more formal review and discussion of the ITS governance process that ACTT has been introduced to in prior meetings. The team is hopeful that the process will improve prioritization of academic and digital learning projects relative to the other portfolio groups. Questions remain about the relationship between the ACTT and the ATDL portfolio group. ACTT in its current configuration may well serve to help academic projects ‘bubble up’ to the next level for improved visibility and prioritization. ACTT’s work can help inform the governance process through evaluations, pilots, and recommendations. The portfolio group is a place where such activities can be shared to help inform decisions about projects. The governance process will require some adjustment to technical processes and perhaps some additional communication and education of stakeholders to help non-IT community members engage. How might we better engage all members of the portfolio team in discussions of academic tech and digital learning beyond technical considerations? How might we work to develop shared language to talk about academic projects and needs? First question: Do we all need to be there? What representation do we want/need? No immediate decision or changes agreed on regarding current membership or attendance at ITS gov monthly meetings. Expected organizational directions and may result in revisions to current portfolio group membership in governance process. This topic will be revisited. Canvas orientation site for students project will need to continue to be improved and revised. Agreed on a desire to update a single resource for all Middlebury students and faculty. Monterey integrated the student quickguide for students at the course-level menu in the Institute’s sub-account for all courses. Based on schools abroad and Institute sites, different strategies for presenting Canvas orientations were discussed. What do we want these sites to do for students? What needs to be there? Sean is interested in getting some additional feedback from students (ODL and DLC interns) to determine how we to proceed. Expects to work with Amy S. on ways to collaborate, collect feedback, and improve the orientation experience for first-time Canvas users. This entry was posted in Midd Blogosphere and tagged Closed, Core Team, Meetings, notes on September 25, 2017 by actteam. Request to add “UDOIT” to Canvas: Accessibility LTI that generates a report on a Canvas site to let faculty know when accessibility issues are present in a course. Joe will meet with the faculty to determine what the implementation is for, and whether this should become a project. No ACTT meeting next week as we’ll be meeting as IT-GOV-ATDL. A couple of requests to add “Poll Everywhere” to Canvas. Allows for polls to be administered directly through Canvas in a synchronous / on-ground classroom. How useful is the information? What can / should we use? What do we not need? And what is missing? We have Canvas for three years. We need to be able to evaluate its use in order to determine whether Canvas (or any LMS) is a good technological choice for Middlebury. Is there a reliable connection between statistics and “engagement” or “quality” of learning? Biggest use at Monterey is for class resource web sites and for flipped instruction models. Monterey has very few purely online courses. There’s a certificate program with several online courses, but is blended with on-ground courses. The College does not have online courses. The Hebrew School is “hybrid” but also fully online part of the year. Can we define Canvas as a learning space–as more than a platform for distribution and submission? Should it / can it be used for more than file sharing? Or should we be looking at implementation of other technologies that accomplish the same thing? What kinds of functions can we look at to determine if Canvas is being used well for teaching and learning? How do we measure those functions? How do we apply an analytic to determine good pedagogy or successful teaching and learning? We can’t really understand what’s happening in classes without talking to students and teachers. Should we figure out a way to do some qualitative research with teachers and students across Middlebury to determine how Canvas is being used? What works? What doesn’t work? What does teaching with technology look like at Middlebury? We could try to align Canvas data with our findings from doing qualitative research. Start with “power users” to begin developing stories about how Canvas is being used. Expand the view out by looking at teachers who are using other digital tools in teaching and collect those stories — all to support an analysis of what tools are best for Middlebury. Look for faculty from different programs to talk about use of Canvas. Invite Canvas “power users” to discuss use of Canvas for later in this fall. 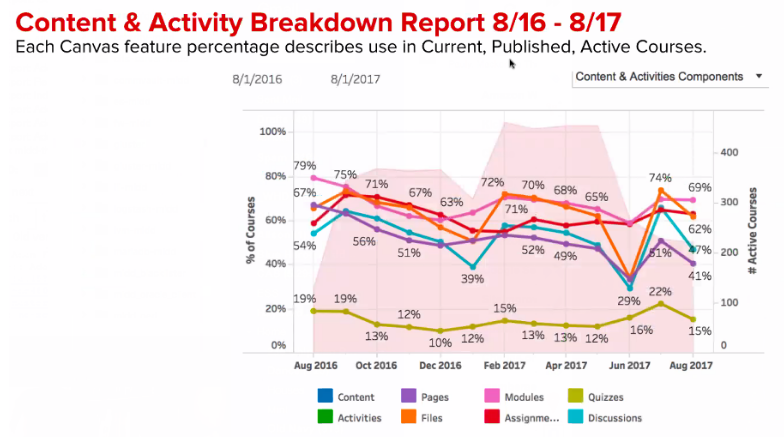 Align findings with Canvas data. Expand that discussion to include other technologies. Begin larger discussion about use of digital technologies for learning and teaching in Canvas. This could provide a model for qualitative research for future tech evaluations. This entry was posted in Midd Blogosphere and tagged Closed, Core Team, Meetings on September 8, 2017 by actteam. Instructure, the company that hosts Canvas, will be presenting an Executive Business Review, sharing data pertaining to Middlebury’s use of Canvas in the first year. This presentation will provide us with insights into how Canvas is being used and supported, and lay the groundwork for future evaluations. Kelly Jerome, our Customer Success Manager from Instructure presented. Stats are per-month, due to rolling on and off of terms, the data isn’t always reflective of a particular term. Can get details on sub-accounts. Includes support details, SLA compliance, support mechanism (phone, chat, email), and user-type. For real-time reporting, the Canvas data-API would need to be used. For much custom reporting this would require our own developer time to leverage. Instructure has several pre-built reports that could be purchased that wouldn’t require local resources. A copy of the report can be seen here. Please log in with your Middlebury username and password to view. This entry was posted in Midd Blogosphere and tagged Closed, Extended Team, Meetings, Middlebury Community Interest, notes on September 1, 2017 by Joseph Antonioli. Noted that LTIs from publishers were added. A: We should check the list and note the last time the LTI was evaluated. Will there be challenges for SSO? Canvas uses CAS, Zoom uses ADFS. Slides and spreadsheets can be used in Collaborations, as well as docs. Files from both services can be submitted for assignments, and evaluated using the SpeedGrader. Assuming testing goes well we will pilot in the production instance in the fall, then evaluate. Instructure will present a review of Middlebury’s use of Canvas in the first year. This will happen at the ACTT meeting on Aug. 22nd. Joe is working on a launch roadmap for Panopto. Dates have been shared, please send feedback. ACTT Core Group notes will be published to the site. This entry was posted in Midd Blogosphere and tagged Closed, Extended Team, notes on August 14, 2017 by actteam. It is that time of year again! In this meeting we will be going over the orientation sessions for Language Schools and Bread Loaf. Campus changes over. Some undergrad dorms become administrative & faculty offices. People who miss arrival center on Friday are often challenged by not having assistance other than Public Safety over the weekend. Bilinguals: Traditionally, these support staff have assisted with technology help by translating tech questions to students. Also usually in charge of each school’s web presence during the summer. Send requests related to the orientation spreadsheet to Joe A.
DMTs: Unclear how much DMT support will be available. 2 separate start dates. “Hard” languages get extra weeks. Every Curricular Tech & Library training will ideally be preceded by a General Tech Training as it can be hard to focus on other info if you can’t log in. Often run by Pij & Zach (and their colleagues). Suggestion: Have someone who can reset accounts in room. Alternate suggestion: Get people to set up their accounts before they come to campus. Challenge running orientation for different student levels (undergrad – masters – doctoral). Help instructors set up their class resources. Challenge: different ways each school schedule their classes/sections. Academic Tech staff available for consultations for those who need more in-depth help. This entry was posted in Midd Blogosphere and tagged Closed, Extended Team, Middlebury Community Interest, notes on April 11, 2017 by Joseph Antonioli.